Have you ever been told to "proceed direct" to a particular waypoint but been unable to skip the en-route waypoints between the two on your GPS? It's possible with the default GPS but the process isn't as straightforward as you might think. This post provides more information on why incorrectly flying "direct" can be problematic for other traffic. 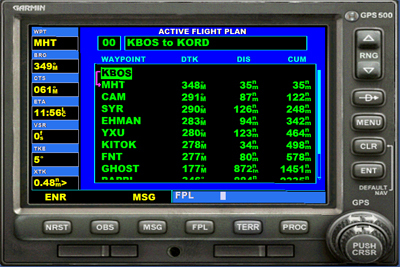 For example, let's say you program the GPS with a route from KBOS to PVD while on the ground. The GPS will draw a straight line from the airport to the VOR. However, as you depart KBOS, ATC will likely vector you away from this original line. 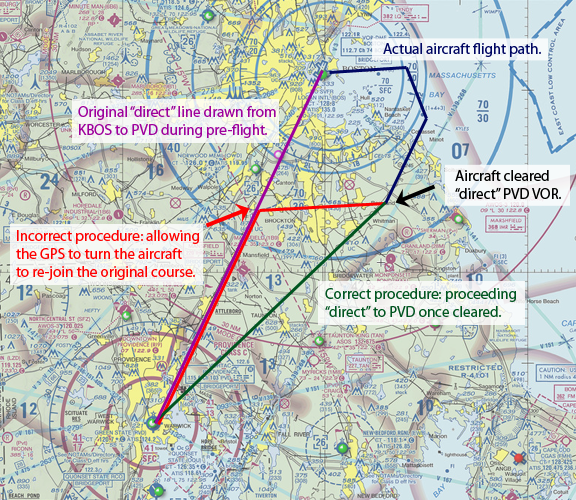 When ATC eventually tells you to "proceed direct Providence", engaging the GPS and watching the aircraft turn back to join up with the line is dangerous and incorrect. "Direct" means exactly that, and ATC predicates the "direct" clearance on the basis that it will be complied with. Allowing the aircraft to join up with the pre-existing line could well put you in the way of other traffic. For that reason, whenever you are using the GPS as the primary mechanism of navigation, you'll need to re-draw the line so that it starts from your current position if you are instructed to proceed "direct". Of course, if you are using VOR navigation, this doesn't apply. 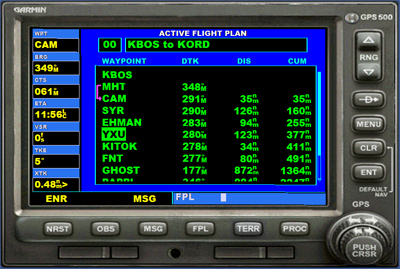 The Solution: Correctly Programming the Default GPS for "Direct"
To show the solution, we'll use a slightly longer flight plan from KBOS to KORD using the following route: MHT CAM SYR J63 EHMAN YXU J547 FNT SAYRS2. 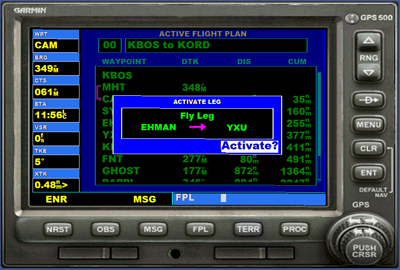 You've just crossed MHT and now ATC tells you "proceed direct EHMAN, then on course". Rather than having to re-program your GPS, you can re-program it to skip some of the waypoints you have already entered. Follow the steps below to "skip" from your present position, fly directly to EHMAN, and then re-join your filed route. 1. Click the "FPL" button, then click on the middle of the circular knob at the right (the "PUSH CRSR" button). This will highlight your first/next waypoint. 2. Using the upper set of arrows, scroll down until the waypoint you want to "skip" to is highlighted. 3. Click the "MENU" button, then "ENT" to activate that leg. 4. Click the "FPL" button to close that menu and return to the view of your flight plan. Your airplane should now be direct to the waypoint/leg you selected! Thanks for the tip. Is it possible to manually enter in several waypoints into the default gps? I have tried many times but have failed to find away. Thanks. I don't believe you are able to do this directly through the GPS. However, it seems that you should be able to go through the Flight Planning are and enter multiples waypoints there, which would then load into the GPS. Or, you can always use the Generate Routes area of http://www.simroutes.com and download the PLN file to load in that way. Alright thanks for the advise. This is awesome Evan. Thanks! This is a rather old question on the site but I think there is at least one question still unanswered and I have a solution. To add waypoints to an FSX flight plan is fairly simple. Open your existing flight plan in FSX and you will be at the "Create" tab. Click on the "Edit" tab. That will show the map with your existing flight plan superimposed upon it. Put your cursoe on the red line which represents your exiting route, push and hold down the left mouse button and drag it to the waypoint that you wish to add. It then modifies the course as seen on the red line and adds the waypoint to your list of existing waypoints. Hope this helps. I think they mean in THE Gps itself. They want to not have to pause the game to go into the map. Understand now. I had forgotten that accessing the FSX map pauses the game. Thanks for reminding me of that.